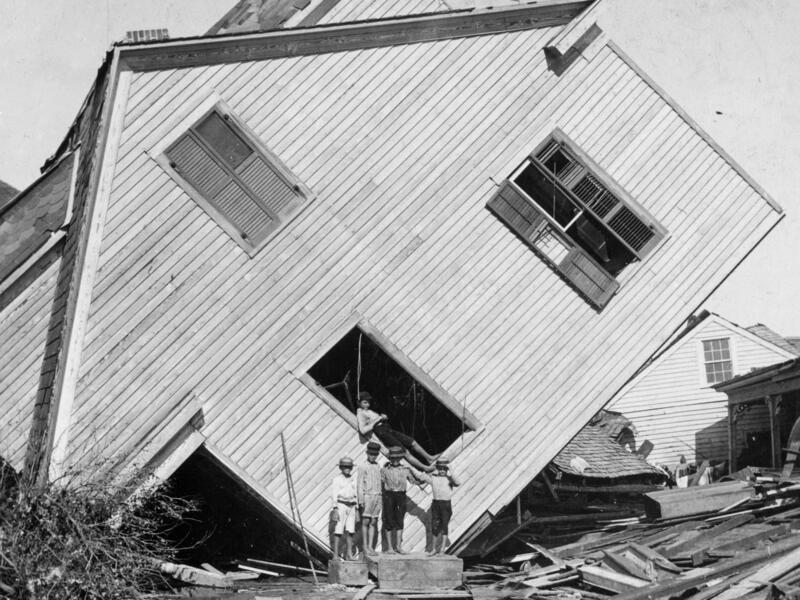 A house tipped on its side, with several boys standing in front, after the Great Galveston Storm in Texas. The storm remains the worst natural disaster and the worst hurricane in U.S. history. 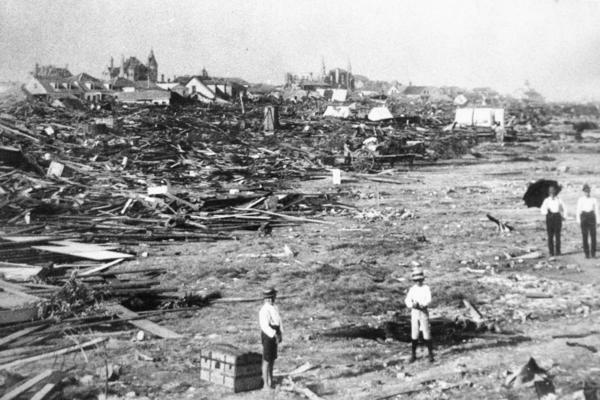 More than 6,000 people were killed and 10,000 left homeless from the Great Galveston Storm. At the dawn of the 20th century, Galveston was the grandest city in Texas. After the 1900 storm, it would never regain that status. 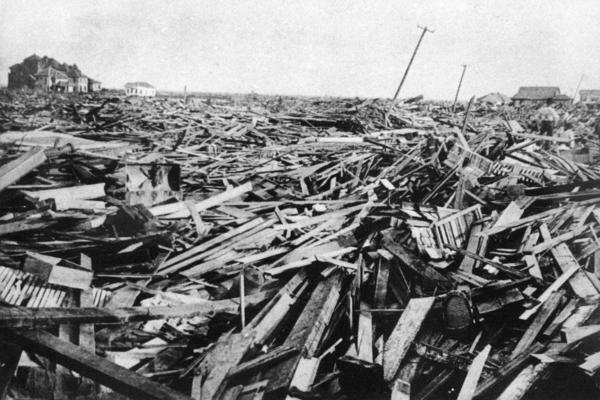 A large part of the city of Galveston was reduced to rubble. Men carry a body on a stretcher, surrounded by wreckage of the hurricane and flood in Galveston. 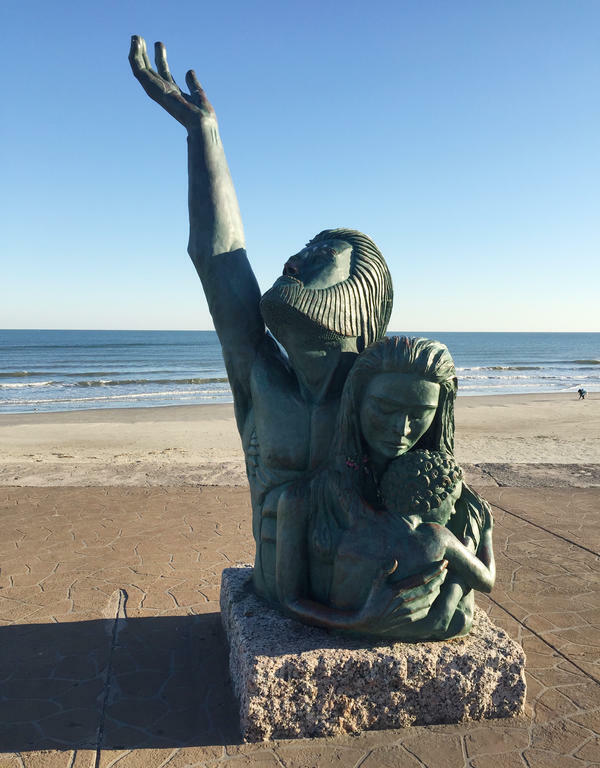 A memorial was placed on the Galveston Seawall to commemorate the 1900 Storm that killed 6,000 to 12,000 people — the worst natural disaster in U.S. history. Thursday is the last day of the official 2017 hurricane season. It's been the most destructive year in recorded history, according to the National Hurricane Center, causing what may turn out to be more than $200 billion in damages. It's also the first time that three Category 4 hurricanes have hit the United States in the same year. For all the ruination in Texas, Florida and Puerto Rico, at least Americans could see the hurricanes coming. TV networks covered the storm tracks exhaustively. But what happens to an American city when a hurricane strikes without warning? The Great Galveston Storm came ashore the night of Sept 8, 1900, with an estimated strength of a Category 4. It remains the deadliest natural disaster and the worst hurricane in U.S. history. From 6,000 to 12,000 people died on Galveston Island and the mainland. Texas' most advanced city was nearly destroyed. Forecasting was primitive in those days — they relied on spotty reports from ships in the Gulf of Mexico. Citizens of Galveston could see that a storm was brewing offshore, but had no idea that it was a monster. "Everyone went about their usual tasks until about 11 a.m. when my brother, Jacob, and our cousin, Allen Brooks, came from the beach with the report that the Gulf was very rough and the tide very high," remembered Katherine Vedder Pauls, not quite 6 years old at the time. Her oral history and others used for this report are archived at Galveston's Rosenberg Library. "About half past 3," she continued, "Jacob and Allen came running, shouting excitedly that the Gulf looked like a great gray wall about 50-feet high and moving slowly toward the island." At the dawn of the 20th century, Galveston was the grandest city in Texas. It could boast the biggest port, the most millionaires, the swankiest mansions, the first telephones and electric lights, and the most exotic bordellos. After the 1900 storm, she would never regain her status. "No tongue can tell it!" What became of the people of Galveston is the story of what happened before accurate weather forecasting, mandatory evacuations, and storm building codes. "We knew there was a storm coming, but we had no idea that it was as bad as it was," said William Mason Bristol, who was 21 when he rode out the storm in his mother's boardinghouse. "You see, we didn't have a weather bureau that give us the dope that they got now...They had no airplanes to go up there and see how bad it was." The hurricanes of 2017 were destructive in terms of dollars, but the official death toll remains well under 300. In 1900, thousands died. The unnamed hurricane swept in from the Gulf with an estimated tidal surge of 15 feet, so high that it swallowed the skinny barrier island that was only 5 feet above sea level. "Oh, it was a awful thing. You want me tell you, but no tongue can tell it!" recalled Annie McCullough. She was about 22 years old in 1900. Her family was on a mule-drawn wagon trying to escape the rising tide. "The water was comin' so fast. The wagon gettin' so it was floatin'. The poor mules swimmin' that was pullin'. And the men laid flat on their stomach, holdin' the little children." Survivors wrote of wind that sounded "like a thousand little devils shrieking and whistling," of 6-foot waves coming down Broadway Avenue, of a grand piano riding the crest of one, of slate shingles turned into whirling saw blades, and of streetcar tracks becoming waterborne battering rams that tore apart houses. "The animals tried to swim to safety and the frightened squawking chickens were roosting everywhere they could get above the water," Pauls remembered. "People from homes already demolished were beginning to drift into our house, which still stood starkly against the increasing fury of the wind and water." At the height of the storm, John W. Harris remembered two dozen terrified people climbing in through the windows of their home on Tremont Street. His mother prepared for rising floodwaters by lashing her children together. "Mother had a trunk strap around each one of us to hold onto us as long as she could," he recalled. Rosenberg School, built of brick, became a refuge for Annie McCullough's family and many others. "The people was screamin' and hollerin' and so, huntin' their folks," she said in an oral history recorded by her grand-niece, Izola Collins. "The wind! Those men that was in the school, all they could do was stand against those doors and hold 'em." The single most heart-wrenching tragedy happened to St. Mary's orphanage. 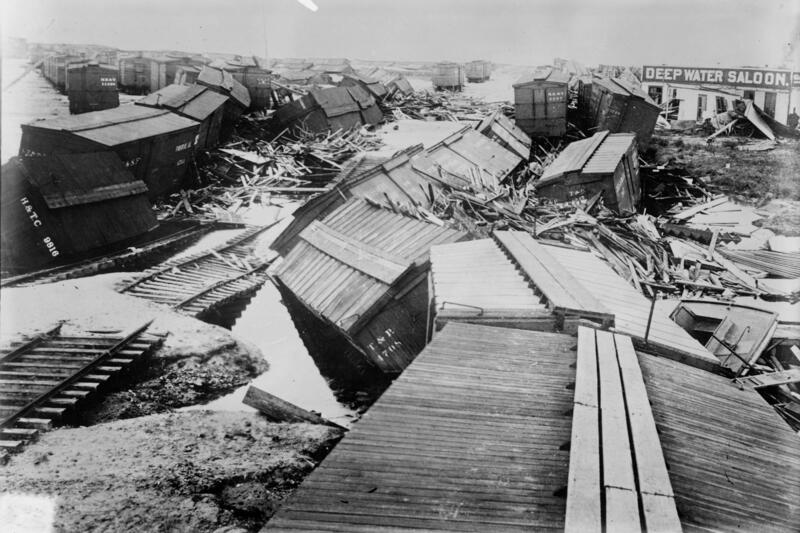 Ten Catholic nuns from the Sisters of Charity of the Incarnate Word and 90 children died when fearsome waves destroyed two wooden dormitories, that were built close to the beach in the belief that ocean breezes would reduce the danger of yellow fever. The sisters tethered the orphans together with clothesline. That's how they were found the next day, drowned. Only three boys escaped. The storm began to subside about daybreak. The sun rose on Sept. 9 on a coastal city obliterated. One survivor described "knots of people frightened out of their wits, crazy men and women crying and weeping at the tops of their voices." Corpses were everywhere. Authorities declared martial law and began to force men — most of whom were black — at bayonet point to collect the dead, pile them on barges, and dump them in the Gulf for burial. But the cadavers washed back onshore. Finally, they had to be burned in funeral pyres. There were orders to shoot on sight the "ghouls" who stole jewelry from the tangled bodies. "It was a terrible time, it really was," recalled Louise Bristol Hopkins, who was seven. "I heard the stories of women with long hair who had been caught in the trees with their hair and cut to pieces with slates that had been flying." Katherine Vedder Pauls recollected a ghoulish incident that happened to her mother. "She stepped on a barrel concealed by the water. It rolled and she went under with it. She grabbed at something to pull herself up. It was the body of a small girl. Her self-control gave way and she wept hysterically." Harris, who became a prominent banker and philanthropist on the island, lost 11 relatives in the 1900 storm. He remembered the next morning his family was having breakfast in their house, that withstood the waves, when the mayor came by. "He said to father, 'John, your whole family are destroyed.' And I remember it's the first time that I ever saw father with tears in his eyes. He had no idea of the extent of the damage. We hadn't left the house yet." In the years after the horrific storm, Galveston reinvented itself in a burst of municipal determination. The US Army Corps of Engineers constructed a 17-foot seawall. The city undertook an ambitious "grade-raising." Two thousand surviving structures — from shanties to a massive Catholic church — were jacked up and sand pumped underneath. Both the seawall and the grade-raising were regarded as engineering marvels of their day. For decades, people on Galveston Island never spoke of the 1900 storm. "The folks that survived the storm were sort of like people who survived a war," recalled former state Sen. Babe Schwartz, a legendary Galveston figure. He was interviewed in 2000. "No chamber of commerce wants to talk about the worst tragedy in the history of the United States where 6,000 to 8,000 people died on this little ol' island." This story was drawn from a documentary that originally aired on NPR on Sept 8, 2000, on the centennial of the 1900 storm. It was produced by John Burnett in collaboration with the Kitchen Sisters, Davia Nelson and Nikki Silva, for their Lost & Found Sound series. Today is the last day of the official 2017 hurricane season. It's been the most destructive in history - an estimated $200 billion in damages - and the only time that three Category 4 hurricanes have hit the United States in the same year. For all of the destruction, Americans, at least, could see the hurricanes coming. All you had to do was watch TV. This next story is about a time when hurricanes struck without warning. NPR's John Burnett has covered many hurricanes for NPR News. He's now on the Texas coast on the beach on Galveston Island. JOHN BURNETT, BYLINE: Hey, Steve. Well, the reason I'm here in Galveston is because this was the site of the worst natural disaster and the worst hurricane in U.S. history. It came ashore September 8 of 1900. They call it the Great Galveston Storm. They estimate it was a Category 4 with a 15-foot storm surge. It killed 6,000 to 12,000 people and virtually destroyed the city. Forecasting was so primitive in those days, all they had was spotty reports from ships that were out on the Gulf. The citizens of Galveston had no idea that a killer storm was bearing down on them. INSKEEP: Well, how did you go about trying to reconstruct what that experience was like? BURNETT: Well, back in 2000, I did a documentary on the centennial of the hurricane that NPR aired. It was really a labor of love. The project originally was produced with The Kitchen Sisters and their Lost & Found Sound project. So we're going to play an abbreviated version of that. And I do want to say, some of what you're going to hear is very raw and might not be appropriate for young ears. These are oral histories from survivors of the great storm who lived to tell the tale. KATHERINE VEDDER PAULS: Everyone went about their usual tasks until about 11 a.m., when my brother Jacob and our cousin Allen Brooks came from the beach with a report that Gulf was very rough and the tide very high. BURNETT: Katherine Vedder Pauls was not quite 6 years old at the time. PAULS: About half past 3, Jacob and Allen came running, shouting excitedly that the Gulf looked like a great gray wall about 50 feet high and moving slowly toward the island. BURNETT: At the dawn of the 20th century, Galveston was the grandest city in Texas. After the 1900 storm, she would never regain her status. What became of the people of Galveston is what happened before accurate forecasting, mandatory evacuations and storm building codes. This year, hurricanes Harvey, Irma and Maria were destructive in terms of dollars, but the official death toll remains under 300. In 1900, thousands died. The unnamed hurricane swept in from the Gulf with a tidal surge so high it swallowed the skinny barrier island that was only 5 feet above sea level. ANNIE MCCULLOUGH: Oh, it was a awful thing. You want me to tell you, but it's - no tongue can tell it. BURNETT: Annie McCullough was about 22 years old in 1900. Her family was on a mule-drawn wagon, trying to escape the rising tide. MCCULLOUGH: The water was coming so fast. The wagon was getting so it was floating. And the poor mules swimming, they was pulling. And the men laid flat on their stomach, holding the little children. BURNETT: These recordings are archived at Galveston's Rosenberg Library, along with letters and memoirs. Survivors wrote of wind that sounded like a thousand little devils shrieking and whistling, of 6-foot waves coming down Broadway Avenue, of a grand piano riding the crest of one, of slate shingles turning into whirling saw blades and of streetcar tracks becoming waterborne battering rams that tore apart houses. Katherine Vedder Pauls, reading from her memoir, describes how any sturdy building became a shelter. PAULS: (Reading) The animals tried to swim to safety, and the frightened, squawking chickens were roosting everywhere they could get above the water. People from homes already demolished were beginning to drift into our house, which still stood starkly against the increasing fury of the wind and water. BURNETT: At the height of the storm, John W. Harris remembered two dozen terrified people climbing in through the windows of their home on Tremont Street. His mother prepared for rising floodwaters by lashing her children together. JOHN W. HARRIS: Mother had a trunk strap around each one of us to hold on to us as long as she could. BURNETT: Rosenberg School, built of brick, became a refuge for Annie McCullough's family and many others. MCCULLOUGH: And the people were screaming and hollering and so - hunting their folks. The wind - those men that was in the school - all they could do was stand against those doors and hold them. BURNETT: The sun rose on September 9 on a coastal city obliterated. One survivor described knots of people frightened out of their wits, crazy men and women crying and weeping at the tops of their voices. Corpses were everywhere. There was never an official death toll, only estimates. 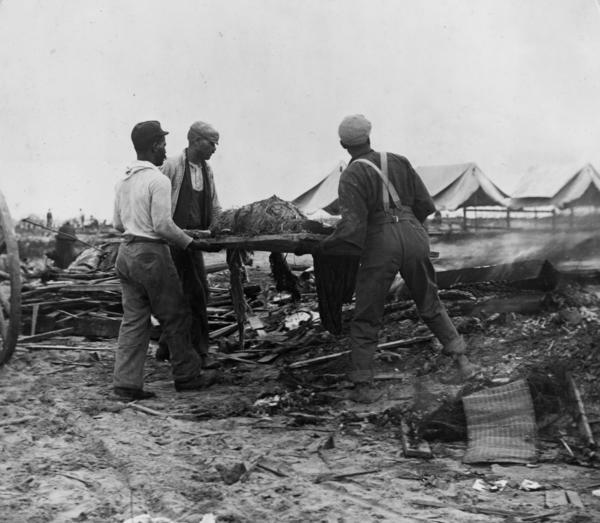 Authorities forced men, most of whom were black, at bayonet point to collect the dead, pile them on barges and dump them in the Gulf for burial, but the cadavers washed back onshore. Finally, they had to be burned in funeral pyres. Thieves who stole jewelry from the bodies were shot on sight. Louise Bristol Hopkins was 7 years old. LOUISE BRISTOL HOPKINS: It was a terrible time. It really was. I heard the stories of women with long hair who'd been caught in the trees with their hair and cut to pieces with slate that had been flying. BURNETT: Katherine Vedder Pauls recollected a ghoulish incident that happened to her mother. PAULS: And once, she stepped on a barrel concealed by the water. It rolled, and she went under with it. She grabbed at something to pull herself up. It was the body of a small girl. Her self-control gave way, and she wept hysterically. BURNETT: John W. Harris, who became a prominent banker and philanthropist on the island, lost 11 relatives in the 1900 storm. He remembered his family was having breakfast in their house - one of the few that stood against the waves - when the mayor came by. HARRIS: He said to father, John, your whole family are destroyed. And I remember it's first time that I ever saw father with tears in his eyes. He had no idea of the extent of the damage. We hadn't left the house yet. BURNETT: As disturbing as those recollections are, today, there's very little in Galveston to remind people of the 1900 hurricane aside from the sea wall that I'm looking at now. It was one of the great engineering marvels of the day. They also raised the city, elevating more than 2,000 structures. INSKEEP: So the city is higher, but did it really recover? BURNETT: It did, but mainly as a tourist town. It was Houston, farther inland, that grew into the metropolis on the Gulf Coast. And now with Hurricane Harvey, Houston has just experienced the worst catastrophe in its history. INSKEEP: NPR's John Burnett in Galveston, Texas. John, thanks very much. BURNETT: My pleasure, Steve. Transcript provided by NPR, Copyright NPR.